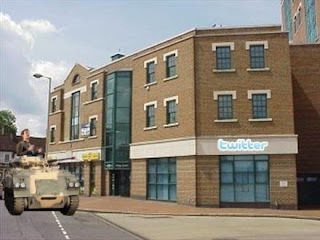 In a move not entirely unexpected that some had seen as inevitable after Twitter's rejection of a buyout, and the more recent layout changes to Facebook, Mark Zuckerberg was seen advancing on Twitter's San Francisco headquarters in an FV432 armored personnel carrier on Wednesday. His demands are not entirely clear, but it is presumed that he is trying to enact a hostile takeover of the company of under 100 employees by force. Witnesses report Zuckerberg shouting phrases such as "Got you now, suckas!" and "I'll show you not ready!" Tweets from various employees inside the building now under siege generally had a tone of bewilderment and shock, although they generally were still not ready to give up their company to the marauding Zuckerberg. "Has he finally lost it completely? Is that a tank? Can he do this?" "Should we call the police? The army? What do we do?" "Zuckerberg can't have our company until he flattens it" were a few of the tweets coming out of the building. Meanwhile, rumors of an internal coup back at Facebook while Zuckerberg is away have also been floating around, due to the percieved distates for Zucerberg within his own company.